I’d never heard of Ted Hawkins until I received this album; but the list of performers singing his songs told me he must be something special; and an hour later I sat stunned before pressing ‘play’ again. The album opens with James McMurtry singing Big Things; and it’s every bit as good as anything the Master songsmith himself has ever written. Next up is the starkly observed Cold and Bitter Tears sung; with passion by Kasey and Bill Chambers; and again the emotion seeps through every line of another classy song. Track three and it’s Tim Easton putting his stamp on a bit of a harmonica boogie folk song; if such a thing exists, called One Hundred Miles. Born in Mississippi but finding fame of sorts on Venice Beach; Ted Hawkins came to the attention of several musos in his life; but his itinerant lifestyle and assorted ‘problems’ meant he recorded an album in 1982 called Watch Your Step that received 5 stars in Rolling Stone; but he wasn’t around to promote it so it flopped. Then again he was corralled into a studio in 1994 to record The Next Hundred Years; but sadly not long after its release Hawkins died in ’95 aged 58. The songs here prove what a talent he was; drawing on his own experiences but also interpreting his very vivid imagination and putting the stories to melodies; that have lain gathering dust until now. I’ve played this album on heavy rotation for nearly three weeks now; using it as a palette cleanser in between folk singers, Blues Bands and Country stars and the cream of Americana certainly do justice to his words. Who among you will fail to be impressed by a list of performers that include Mary Gauthier, Jon Dee Graham, Sunny Sweeney, Gurf Morlix and Randy Weeks. Gauthier’s rendition of Sorry You’re Sick will leave you breathless; then when Sunny Sweeney steps up to deliver Happy Hour; you get to wondering what the original must have sounded like; as this is a helluva Country tearjerker. It wasn’t until the fourth or fifth time I played the album when I really listened to Gurf Morlix singing I Gave Up All I Had; and I can only presume that this was his signature song; and one he must have been most proud of as it’s a diamond. There are a couple of other songs that stand out; but by lesser known singers and that makes the writing even more special I guess. I’m particularly thinking about Bring It On Home Daddy by the Damnations and later Peace and Happiness by Steve James. Two songs that would make your ears prick up on any record. 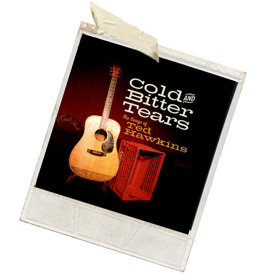 Cold & Bitter Tears closes with a ‘secret track’ which; without giving anything away is Ted Hawkins himself singing; and by that stage in proceedings it will take a very hard heart to stop your eyes welling with tears.